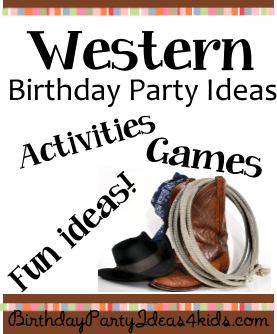 A Western theme birthday party is a great party idea for boys and girls, kids, tweens and teens ages 1, 2, 3, 4, 5, 6, 7, 8, 9, 10, 11, 12, 13, 14, 15, 16 and 17 years old! We’ve gathered all our favorite Western theme party ideas and placed them all on one page. Pick and choose, mix and match your favorite ideas that will best suit your child and the age group of the party guests. Western theme party games, activities, party favors, party food, decorations, invitations – let’s get the Western theme party started! While you’re on the website check out the pages of ideas on party games by age, activities, sleepover and slumber party ideas and everything you’ll need to plan the perfect party. Birthday Party Ideas 4 Kids – Where the party starts!